It takes a skilled workforce to bring big ideas to life, and Oklahoma’s economic development projects are no different. CAD drafters, engineering technicians, electromechanical technicians, construction workers, electricians and HVAC technicians – are all needed to build a business structure from the ground up. Central Tech isn’t just designing buildings, their blueprint generates new infrastructure, creates jobs, expands the economy and powers Oklahoma’s economic engine. Central Tech is a part of the Oklahoma CareerTech System. You may remember it as “Vo-Tech,” formed in 1917, to help Oklahomans succeed in their careers. Currently CareerTech has programs such as agricultural education (formerly Vo-Ag) and family and consumer sciences (formerly Home Ec), in sixth through 12th grades in more than 500 public schools preparing students for careers and further education. High school students and adults take advantage of offerings at technology centers, adults in skills centers (programs for offenders) and through business and industry services. Today, nearly half of Oklahoma’s high school students are enrolled in CareerTech classes. Central Tech is one of 29 tech centers across the state offering specialized career and technical education under the CareerTech system. Central Tech high school and adult students receive hands-on training and industry recognized certification and/or licensure in career fields such as: Architecture and Construction; Arts, Audio/Video Technology & Communications; Business Management & Administration; Health Sciences; Human Services; Information Technology; Law, Public Safety, Security & Corrections; Manufacturing; Science, Technology, Engineering, and Mathematics (S.T.E.M. ); and Transportation, Distribution & Logistics. Training in highly skilled careers keeps Oklahoma’s workforce moving forward. Central Tech recognizes the importance of student’s earning industry recognized credentials as business professionals, graphic designers, health care professionals, law enforcement and security officers, network security technicians, truck drivers and other highly skilled careers needed to keep Oklahoma’s workforce moving forward. 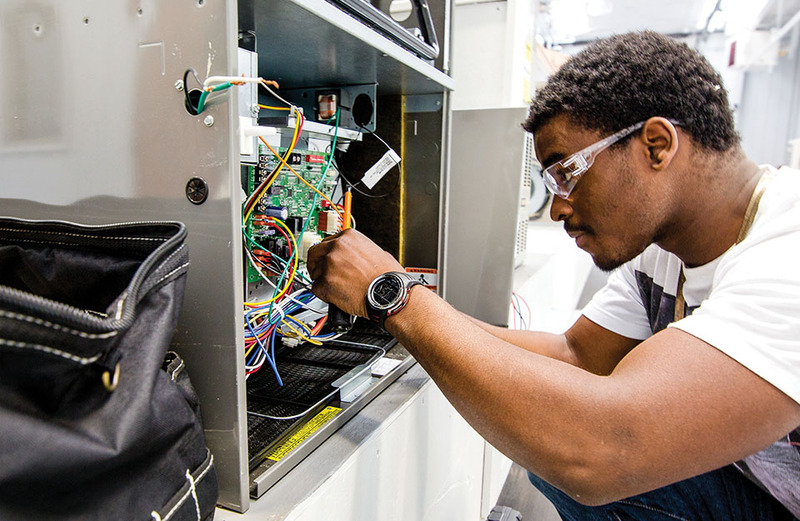 Central Tech’s goal is to connect graduates to high-wage, high-skill, high-demand jobs, and in turn, connect hiring companies to skilled individuals. CareerTech…powering Central Tech and Oklahoma’s economy. For more information about Central Tech classes, business & industry training, or job board-connecting workers to the workforce, visit CentralTech.Edu or call 918.352.2551 in Drumright, or 918.223.9400 in Sapulpa. To learn more about the CareerTech system, visit www.okcareertech.org. HVAC student becoming acquainted with an air conditioner unit in the Heating, Ventilation, & Air Conditioning trades class at Central Tech Sapulpa campus.